Brazing or Welding -- Which Joining Method Should I Use? If you require metal joints that are strong and permanent, brazing and welding are probably your best bets. They both can integrate into production processes and they both use filler metals. However, welding joins metals by melting and fusing them together -- typically with the addition of a filler metal. The result is generally a very strong joint. Welding temperatures start at the melting point of the metals being joined, so you're dealing with considerable heat which can create issues with distortion or warping if the base metals are not thick. Additionally, the process can be energy intensive due to the level of heat required. Brazing, on the other hand, doesn't melt the base metals. Consequently, the brazing temperature is lower than the melting temperature of the metals being joined. This is an advantage of brazing compared to welding when one considers energy savings and the ability of the materials being joined to retain their physical properties. Brazing instead joins the two materials by creating a bond between the filler metal and the surfaces of the two metals being joined. A brazed joint can be stronger than the metals being joined. 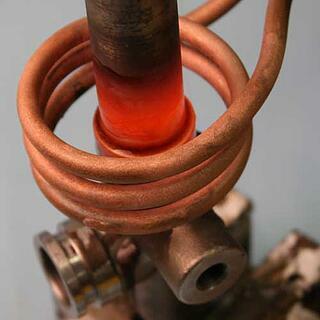 One of brazing's largest advantages is the ability of dissimilar materials to be joined, which is challenging to do with welding when you have two materials with two different melting temperatures. A brazed joint often looks cleaner than a welded joint, and often times welded joints have an irregular appearance. Finally, induction brazing can be easily integrated into manufacturing processes and less operator skill may be required. Of course, ultimately, the method that makes sense for you will depend on your application. If you have dissimilar metals, want to automate the joining process and require flexibility within it, or need to join a thick metal to a thin one, there's a good chance brazing will be the better option. If you have an application in mind, we offer complimentary applications testing from THE LAB at Ambrell. The nearest laboratory will prove out your application and send samples to you for your inspection. Hands-on testing will help you choose the method that makes the most sense for your application.